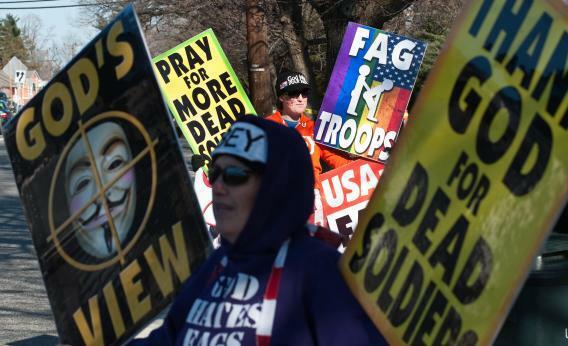 Anonymous hacks Westboro Baptist Church over Sandy Hook picket: Is there a better response? Anonymous Hacks Westboro Church Over Plans To Picket Sandy Hook Funerals. Bad Idea. Shirley Phelps-Roper (front) and her daughter Megan of the Westboro Baptist Church stage a protest across the street from a high school in Maryland on March 1, 2011. Phelps-Roper said the group plans to picket Sandy Hook Elementary School next. Westboro Baptist Church, a virulently homophobic Kansas-based group best-known for picketing the funerals of soldiers to protest the country’s acceptance of gays, will do just about anything for attention. This weekend, it announced plans for a demonstration at Sandy Hook Elementary School “to sing praise to God for the glory of his work in executing his judgment.” In other words, they plan to cheer Friday’s massacre, in the faces of its victims. But this weekend, members of the hacker collective Anonymous gave the Westboro wackos a form of attention they might not have been seeking. Anonymous apparently hacked the church’s website, godhatesfags.com. It took over the Twitter account of Shirley Phelps-Roper, the Westboro member who announced the picket plans. It is pushing a whitehouse.gov petition to have Westboro declared a hate group. And it published online the names and personal details of Westboro Baptist Church members. It’s tempting to cheer Anonymous on as it as it focuses its fury on a group that richly deserves it. Certainly it can be cathartic to find a scapegoat in the wake of a national tragedy, especially at a time when the perpetrator’s motives remain frustratingly opaque. Westboro may be the closest thing to an embodiment of evil that we have handy. But as a rule, Fred Phelps and his deranged band of devotees are best ignored. They trade in hatred and feed on the outrage they provoke, so any attempt to engage with them tends to be counterproductive. Anonymous, meanwhile, is often driven by worthy ends but has no qualms about employing dirty, illegal, or coercive means. On some level, its actions here feel like stooping to the church’s level. Check out the video publicizing the attack and it will quickly become clear that Westboro isn’t the only creepy party in this fight. So instead of including that video here, I’ve embedded instead a video of one of the more productive responses I have seen to Westboro’s bile. In 2010, the group trekked to Palo Alto, California, to hurl its anti-gay messages at the students of Gunn High School following a tragic spate of suicides there. Instead of exchanging epithets with the group, the students decided to face them down with love. Their pro-tolerance counter-protest dwarfed Westboro’s threadbare picket line, and their songs drowned out its shouts. Maybe it’s naive to think that anything but a vicious counteroffensive could defuse Westboro’s assaults on decency. After all, other groups have responded in the same way as the Gunn students, and it hasn’t seemed to dissuade the group from its efforts. But I’ll say one thing for the love-and-peace approach: By the time Westboro packed up and went home, the students involved felt stronger, prouder, and more connected than they had before the bigots arrived.